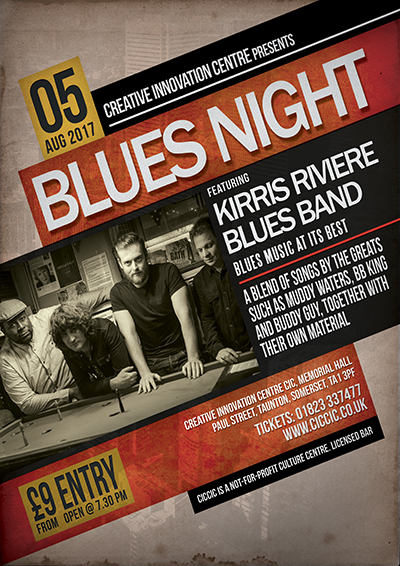 Saturday 5th August Kirris Riviere Blues Band – Doors open 7.30pm – Band starts 8pm. Kirris Riviere Actor, Singer, Teacher. From early on has always been driven by the goal to achieve, Kirris’ granddad was a huge influence in his life, he was obsessed with the blues and coming from the Caribbean was soaked in Calypso, Mento, Blues and Reggae. During the six years that the band has so far been together, they have gained a reputation for being one of the best electric blues outfits in Bristol, and gig regularly across the South West in top venues and clubs. Their show features a blend of songs by the greats together with a collection of their own material – guaranteed to help you ‘getcha blues on’. Being heavily involved in the Bristol music scene running a host of different blues band projects, one his biggest achievements to date is performing at the legendary Glastonbury Music Festival a few times. His band Kirris Rivere Blues Band plays regularly in the South West and is held as one of the best Blues Bands in Bristol. Kirris enjoys whatever he sings and can be heard singing Soul, Funk and Jazz too.